In spite of being too many wild sanctuaries and tiger reserves in India, the hunting down has not faced any kind of restrictions till today and so large varieties of wild animals are falling prey to the ferociousness of human beings. 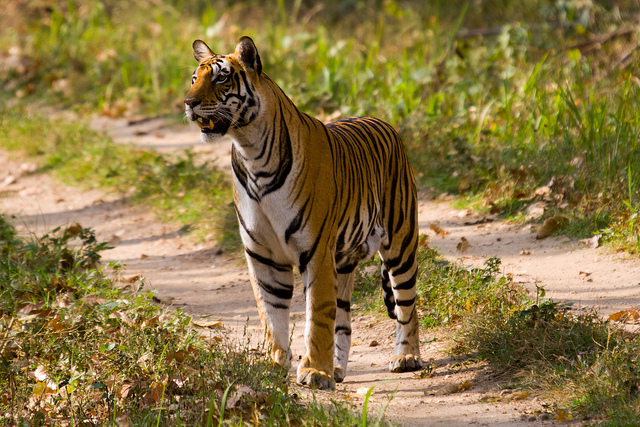 To overcome this deadly issue and for the sake of wildlife conservation, especially to the tigers in India, the National Tiger Conservation Authority (NTCA) has launched a pilot project in Jim Corbett National Park for 24*7 surveillance of the park that has included the latest high definition cameras. The project has been christened as project E-eye (electronic eye, a software based system where 10 high resolution thermal and infra red cameras are mounted over the towers at the area of 350 sq km of most sensitive zones of the park in Uttarkhand. The cameras have the efficiency to capture the images of the objects weighing more than 20 kg and provide alerts in case of any crossing over of the boundaries. The captured Images and alerts are sent to the control room in the park and the NTCA office in Delhi. The cameras are intelligently placed all over the park covering area of 350 km of the area and are controlled by NTCA officials sitting in Delhi. Due to shortage of field staffs it was getting difficult to keep an eye on the park activities especially if it is witnessing any turbulent one and the installation of the cameras brought down the control over the infiltration in the area radically. The cost accrued to this project is around Rs. 3.5 Crores. The DIG and joint director of NTCA, S.P. Yadav articulates- “It is for the first time in the world that a surveillance system of this type is being used in any national park. The project was launched some five-six months back to check poaching of tigers in the park.” Further he added, these digital cameras are the great assistant to check infiltration, poaching and illegal mining in the area. As soon as the control room receives any messages or alerts of people or any vehicle inside the premises; and if found any kind of suspicious activities; an alert team is sent to the location. The cameras keep the vigilance 24*7 and function perfectly even during night. The NTCA is planning to replicate the project in other sensitive areas of India’s other tiger reserves once it was initialized at Uttar Pradesh border keeping in mind the preservation of 1,706 tigers in India. Earlier, numerous attempts have been made so as to minimize the unauthorized venture of people like arresting them and preventing any more accesses to the protected zone of the jungle. The whole project of NTCA was being assisted by a Pune based company, Binomial Solutions Private Limited that beholds a group of engineering and management graduates. It was the love for the animals that inspired Ravikant Singh, CEO of the company; the concept of digital vigilance of the park even at night and at several kilometers away through E-eye. It is a full proof anti-poaching system that collects information, processes, filters and then sends as alerts to the control rooms. The HD cameras have one more feature of capturing the thermal and normal image of the body mass irrespective of the presence of dense forests or adverse weather conditions. Thus, through the implementation of this latest technology using HD cameras, we have witnessed one more initiative for wildlife conservation of India.